It has been vague promises of reusing the corridor for a rail transit by the City, but this quickly vansihed, and instead to see a preservation of what make this corridor apart and a reminder of its potential alternative uses, it quickly appeared that the city had negociated the removal of all things related to the railway. That is certainly one of the safest mean to kill any prospect of reactivation of this corridor as a future rail transit corridor (1), it is also a a first blunt to the soul of the place. Many disused urban railway corridors exhale a specific atmosphere found nowhere else in a city, which people growth to appreciate and like it. 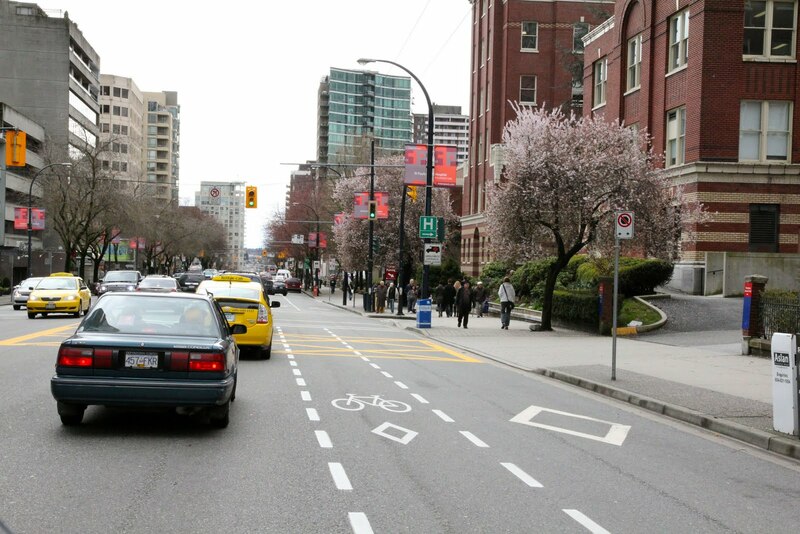 It was also the case for the Arbutus corridor, something Patrick Condon has worded as “People have gotten quite used to the Arbutus Corridor as kind of a romantic landscape — the kind of unkempt quality of it. it’s level of decay has become something that people kind of like…” , what reflects pretty much the position of the current Paris city council, especially as expressed by Christophe Najdovski, the councilor in charge of transportation and public space of Paris, who want to preserve “the mystery and magic” of the Petite ceinture, a disused railway in Paris . Does other solutions were possible? 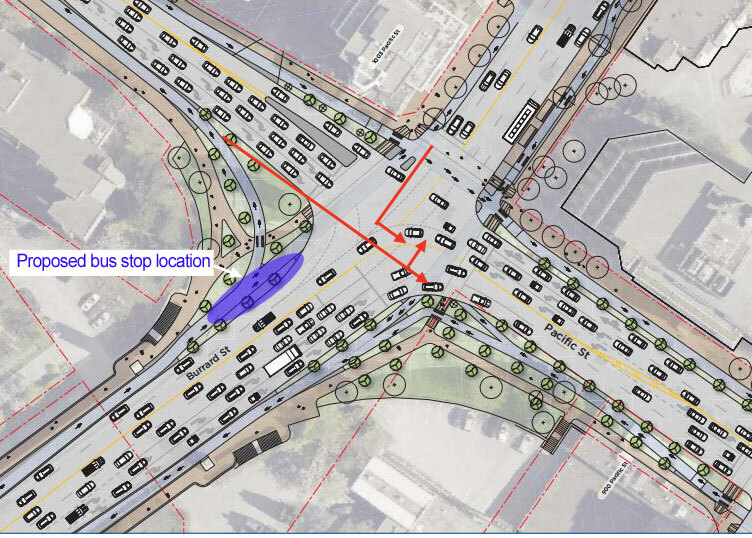 The Joyce-Collingwood Station Precinct rezoning: On the consultation process. A couple of thoughs on this rezoning process. don’t consider the Westbank application for spot rezoning, but don’t reject it outright either – rather contextualize it in an community plan. 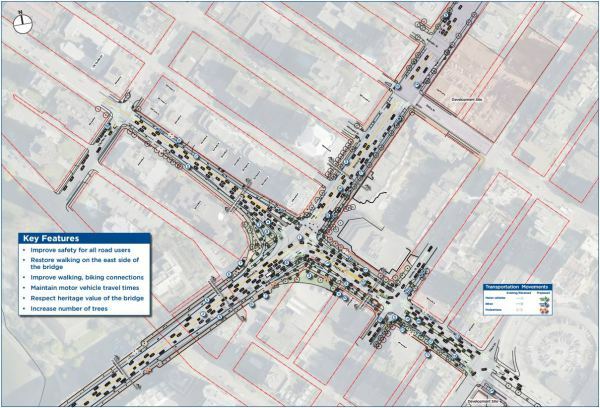 Considering that the previous Joyce-Collingwood Station Area Plan dated back 1987, and considering that effectively, beside the Collingwood village, which has became a posterchild for successful Transit Oriented Development , no much has happened elsewhere- some update was necessary. The transit station precinct specificity is in fine recognized by the perimeter of the rezoning, and this eventually allows to reach a quicker form of consensus (It is a natural density node) . Quickly enough, some people “organizing on the ancestral, traditional, and unceded territories of the Musqueam, Squamish, and Tsleil-Waututh peoples” launched a curiously worded petition and a new organisation popped-up Jara, with very certainly many well intentioned activists. Beside their concerns on “affordable housing”, it has always been hard to understand their ultimate motivations (their last post doesn’t help either), leading them to adopt a rather confrontational approach with the city consultation efforts . The 3d virtual model previously presented in this post was a private initiative: it is my belief that the city should have shared its 3d model with the public (that to allowing the public to interact with it directly). 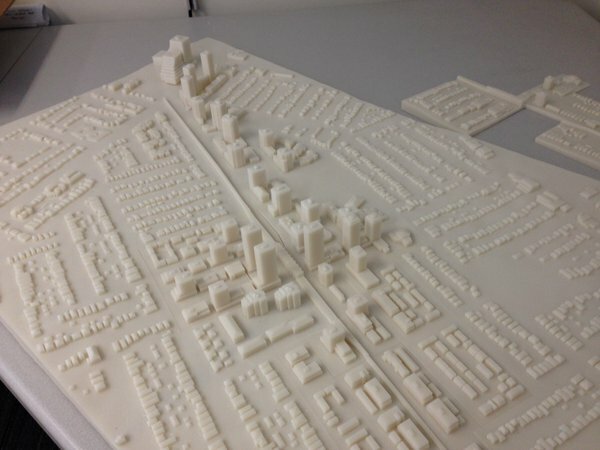 The city presenting a 3d printing to illustrate the envisioned change is very welcome: It is an important tool to help the conversation…thought the model has arrived a bit late in the rezoning conversation (the city planner mentioned, the 3d model was only ready on Friday May 27, 2016), we just hope the city will make larger use of such tools (3d computer model and 3d printing) in the future. I have been made aware by a local mailing list relaying the Collingwood Neighborood House messages, but the city didn’t seem to have advertised the rezoning in the local flyer, the Renfrew Collingwood community news , neither at the Joyce station or other busy areas. This Transit oriented DEvelopment has been the object of numerous study, as well as having attracted the attention of several blog, such as Fraseropolois. This is a striking difference with the Grandview woodland rezoning process, where the Commercial-Broadway station precinct is considered as no more than a sub-zone of the Grandview Woodland community. As such this precinct of regional interest (intersection of 2 rapid transit line) has been bogged down by local concerns which are trumping the general interest. The Jara campaign is also followed by EyeOnNorquay and more generally the rezoning is also follwoed with a critical view by CityHallwatch. Delivered transit service hours have fallen behind the population growth since 2010 reaching levels last in 2008. That is leading to more crowding, more pass-ups and a worsening of the overall transit experience . Revenue service or service supply means service dedicated to move transit passengers (passenger can use the provided service). Total service is the revenue service + technical service (deadhead run, layover…). That is matching the APTA definitions. Translink’s reports tend to easily interchange the both terms. The replacement of a 40 foot bus by a 60 foot bus wouldn’t increase the service hours per capita, but it could address overcrowding. Faster bus routes infer less hours of service but are improving the service offer. The replacement of a bus route by a rail one, offering much faster and higher capacity vehicles, can both address crowding while improving the offer, while resulting in a decrease in total service hours. The seat.km metric; which needs to be understood as (seat+standee).km in the transit world; is a much better way to evaluate the transit supply, and for this reason is widely used in the passenger transportation industry. The effect of the introduction of the Canada line service in late 2009 is clear. Though service hours may have stayed stable since 2011, the seat.km supply has slightly increased thanks to a greater use of articulated buses. The advent of routes 96B and 555, having higher speed than average, also provides more seat.km at constant service hours. Is this enough to keep pace with the population growth? The point is moot. If a downtrend can be observed since 2011, we are nowhere near the 2008 level. 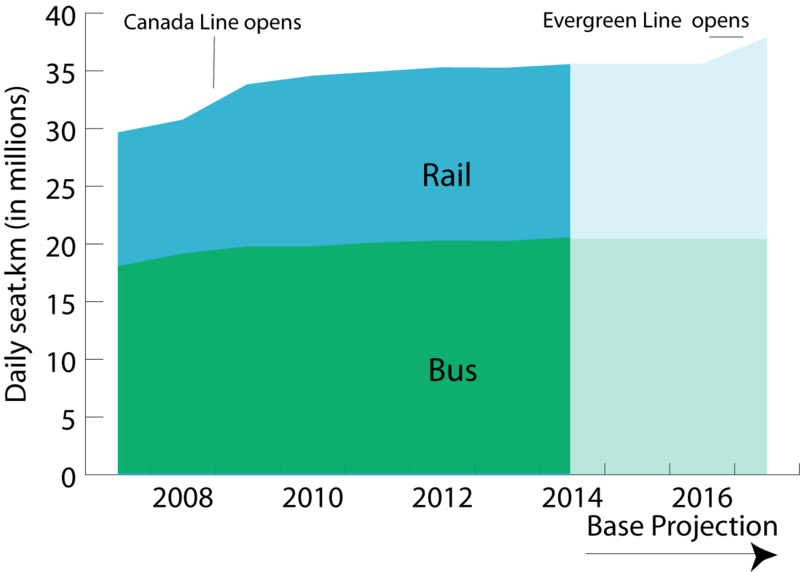 The introduction of rapid transit lines tends to exhibit a positive long term trend. Is the Transit supply good enough or not? The occupancy rate  can be a good proxy to assess the relevance of the supply: the higher the occupancy rate is, the more likely crowding issues will arise. On the other hand, a low occupancy rate could suggest an excess of capacity. Crowding experienced locally with a low occupancy rate could suggest that the transit supply deployment is not optimal, but some other issues could arise: A directional demand unbalance makes crowding difficult to address without deploying excess capacity on the underused direction. Possibly a transit world specific: even the busiest systems don’t achieve an occupancy rate greater than 30%. 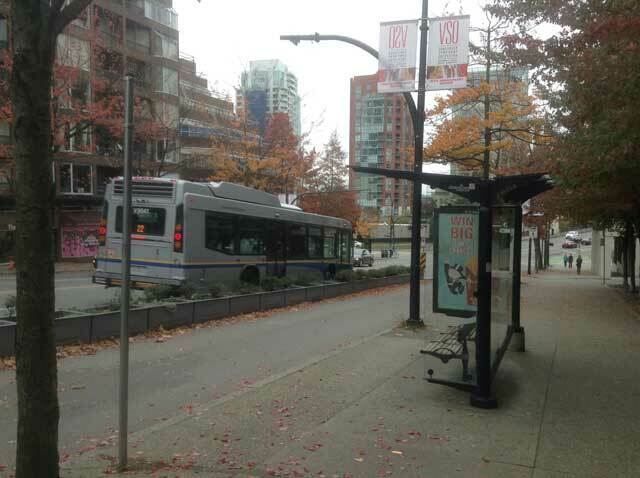 In that light, the TransLink system appears to be a heavily used one. 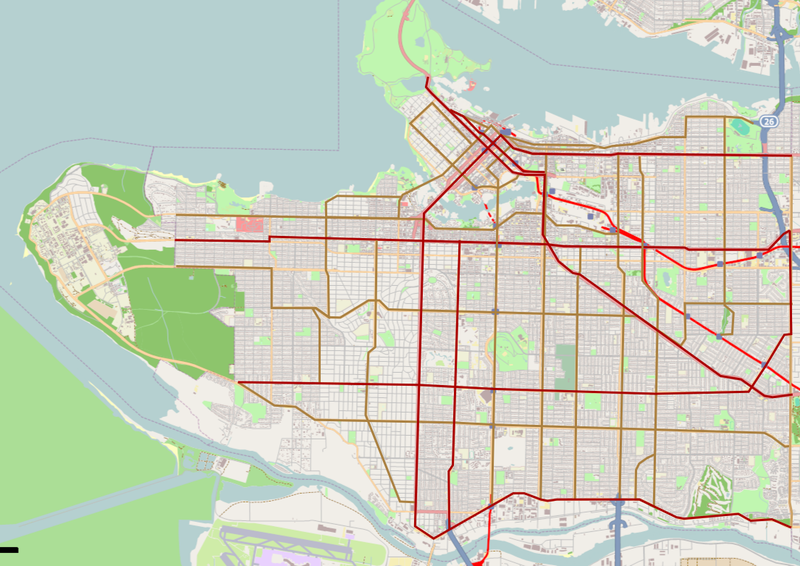 It is worthwhile to note that TransLink estimates the average transit trip length at ~8km  when TfL estimates the average bus trip length at 3.5km and the Underground trip length at 8km . Similarly the average bus or tram trip length is 3.3km and the subway trip length 5km in Paris. The reliability of trip length data could be an issue but a consequence of longer trips in Vancouver is that TransLink needs to provide more seat.km per trip than London or Paris. 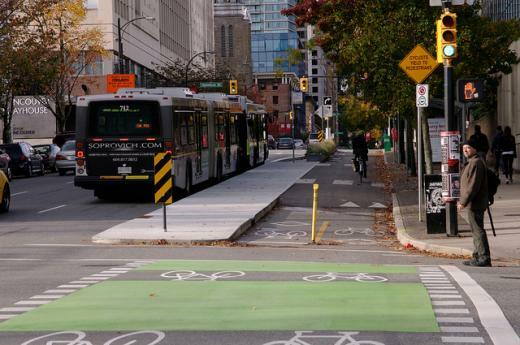 (*) This article has been first published in the December 2014 newsletter from Transport Action BC. Numbers otherwise differ, possibly due to different assumptions, such as on the vehicles’ capacity. The urban areas, used by the association , don’t match either the area covered by the transport agencies, so numbers are subject to caution. Numbers for Paris come from the Observatoire de la mobilité en Ile-de-France, London numbers from TfL  and Hong-Kong numbers from the 2013 MTR Annual report. Number for Portland, including population, comes from the APTA, and includes the scheduled services provided by Trimet, C-Tran, SMART and Portland city. Numbers from the Certu (“Annuaire statistique Transports Collectifs Urbains”, 2014) with bus capacity normalized at 83. Agencies could have different standards (e.g. 6 persons per sqm in Hong Kong). The vehicle capacity is per bus or consist (train) unless otherwise specified. When different vehicle types are used, a vehicle revenue.km weighted average is used. The capacity is per car. Hong Kong Tram capacity is 125, and Hong Kong Airport train capacity is 120 per car. 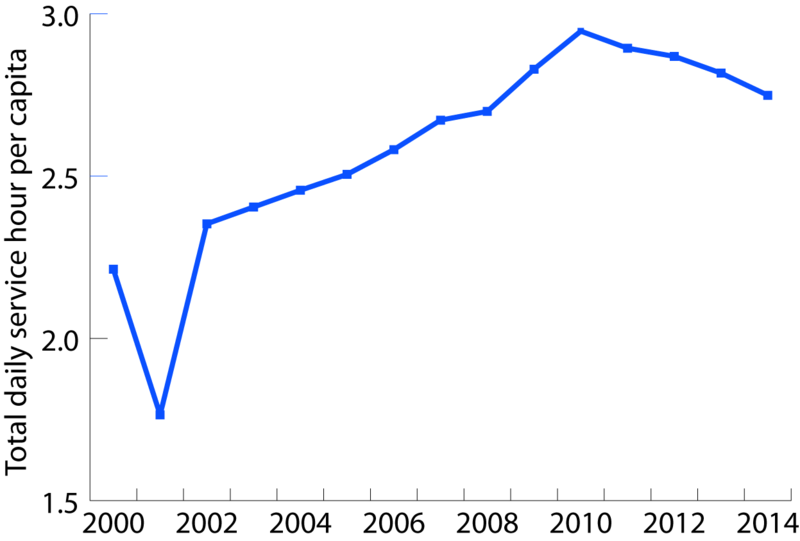 Vehicle Capacity number from Report on mobility an transport #1 – Institut D’aménagement et d’urbanisme- November 2014”. Weighted average of a DLR train capacity (280) and a Tramlink train (200). 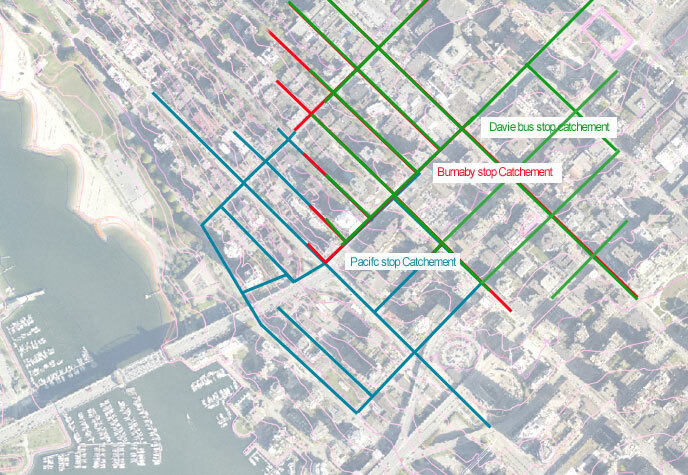 The capacity is per vehicle, the Portland streetcar capacity is 200. Translink: 2014 Business Plan, Operating and Capital – Budget. New Westminster 2014. Transport for London. Travel in London: report 7. London 2014. A narrative largely echoed by Lower Mainland translink advocates as illustrated here.